Click here to return to the C56 Tool homepage. The information in this page is designed to support council officers in the assessment of planning permit applications where Clause 56.07-4 applies. 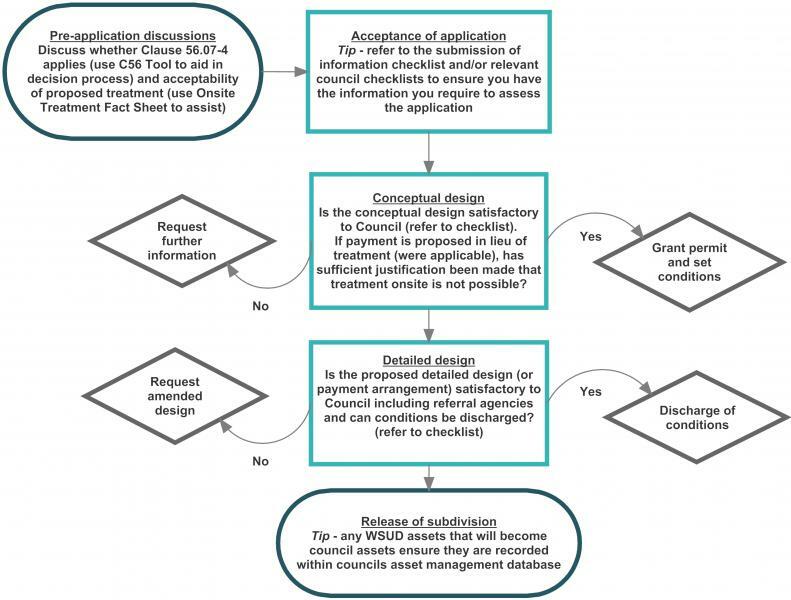 The process diagram below sets out the steps involved in the application process and links to checklists which you can download to assist in the assessment of the application. These checklists should be read in conjunction with the information contained with the Fact Sheets and the Related Resources that will assist in understanding the design considerations for treatment at the lot scale, and precinct scale. This checklist is useful for council officers to determine if sufficient information has been provided with the subdivision application to asses if it has met the requirements of Clause 56.07-4. This checklist is useful for council officers to assess the components of the conceptual subdivision design to ensure it has met the requirements of Clause 56.07-4. This checklist is useful for council officers to assess the components of the detailed subdivision design to ensure it has met the requirements of Clause 56.07-4 and that planning permission can be granted.